It pays to ride in a Harris! 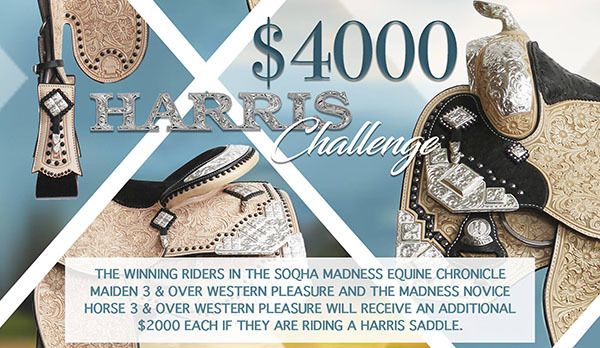 Did you know that an additional $4,000 is up for grabs at the SOQHA Madness, if you ride in a Harris Lather and Silverworks Saddle? The winning riders in the SOQHA Madness Equine Chronicle Maiden 3 and Over Western Pleasure and the Madness Novice Horse 3 and Over Western Pleasure will receive an additional $2,000 each, if they’re showing in a Harris saddle. The SOQHA Madness is scheduled for May 10-12 and May 14-19 in Wilmington, Ohio. Click here for a showbill.